Purchased primarily for its film/broadcast, photography and corporate clients, the Chroma-Q Space Force LED soft light has also proven itself on some of Colour Sound's entertainment projects due to its extremely high quality, variable white light. Colour Sound managing director, Haydn Cruickshank commented: "Recently we've had more and more requests for a versatile white space light, and the Space Force has really helped us to fill that gap. As an LED fixture, its cool running and no fans means no noise, which makes it perfect for the demands of film and production work. Also, its range of colour tones is a real strength for any lighting application." 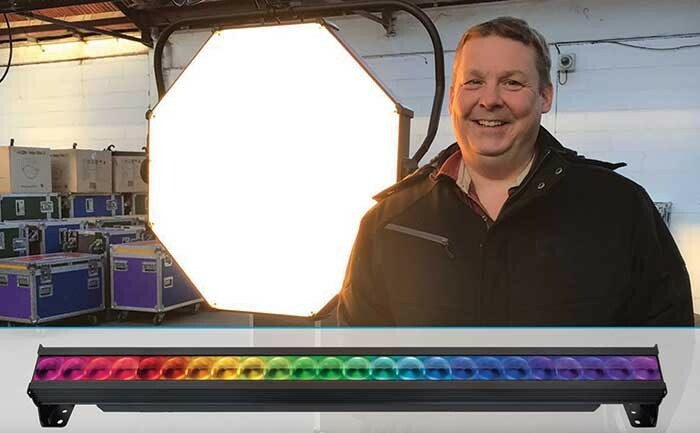 Haydn has also been impressed with the Chroma-Q Color Force II 72 LED batten, cyc and washlight, which Colour Sound invested in last year to bolster its stock of the original Color Force 72 fixture. He commented: "Although our Color Force battens have been a fantastic product and are still for hire after many years of regular use, with the technology moving on we decided it was time to upgrade to the Color Force II. Like its predecessor it has, in my opinion, significantly raised the performance bar again for an LED alternative to traditional cyc, wash and effects lighting sources."